The training for the Seattle Marathon has begun…actually last spring before I walked the Skinny Raven Half-Marathon. This picture was taken toward the beginning of the Skinny Raven Race. My daughter’s call came regarding the Seattle Race. She asked me to do a half marathon with her. I said, “yes,” since I’ll have more than three hours with my daughter and will continue all the benefits of distance walking as I train. 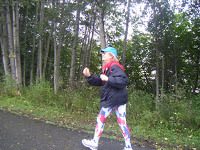 After finishing the Skinny Raven Half Marathon in August of this year, I continued to walk. For the Seattle training here in Anchorage, I anticipated a lot of walking in cold damp rainy weather. Walking in miserably cold rain hasn’t happened. Again today the weather was absolutely beautiful for a sunny warm fall day. The only obstacle is the occasional moose browsing in someone’s yard. I’ve just been alert to the possibility and change directions accordingly. I know that as October continues Anchorage’s weather will eventually provide snow. While I’ve always been cold in Seattle over the Thanksgiving weekend, I don’t remember it snowing. I’m looking forward to the training and the actual Seattle Half Marathon.